With Republicans nervous about losing another special election, Trump is making a last-minute intervention in next week's race. WASHINGTON — On Saturday, Donald Trump will try to do in Ohio what he couldn’t do in Pennsylvania in February — pull a Republican across the finish line in a tight special election. The Columbus suburbs will host the last major partisan electoral test before the crucial November midterms in a special congressional election Tuesday. Republicans have been scrambling to hang onto a seat they’ve held for 35 years in the face of surging Democratic enthusiasm. Ohio's 12th Congressional District tilts to the right, but GOP outside groups have spent nearly $4 million to support Republican Troy Balderson, a state representative whose campaign has spent an additional roughly $1 million, either on its own or in conjunction with the National Republican Congressional Committee. Democrat Danny O'Connor, a 31-year-old county official who has tried to distance himself from House Minority Leader Nancy Pelosi, appears to have closed the gap with Balderson, with a recent poll from Monmouth University showing him just one percentage point behind. A June survey from the same pollster had Balderson leading by 10 points. "This race has definitely tightened in the past month. This is similar to the trend we saw in our polling of the Pennsylvania special election earlier this year," said Patrick Murray, Monmouth’s polling director. Operatives in both parties agree O'Connor is not as strong a candidate as the Democrat in the Pennsylvania race, Conor Lamb, nor Balderson as weak as the Republican in that contest, Rick Saccone. But that could make the race a better predictor of the national partisan environment than other high-profile elections that turned on unique factors, like last year's Alabama Senate race. "This is still a Republican-leaning district with many metrics that continue to favor Balderson, but growing Democratic enthusiasm has made this race surprisingly competitive," Murray added. While there are many less conservative House districts at play in November, the 12th is the most educated and affluent district in Ohio, making a bellwether of the suburban voters Democrats are counting on flipping across the country as they try to pick up the 23 seats they need to regain control of the House in November. Trump won the district by 11 percentage points in the 2016 presidential election, and will try to galvanize supporters with his rally Saturday in Delaware County, the district's key swing region. 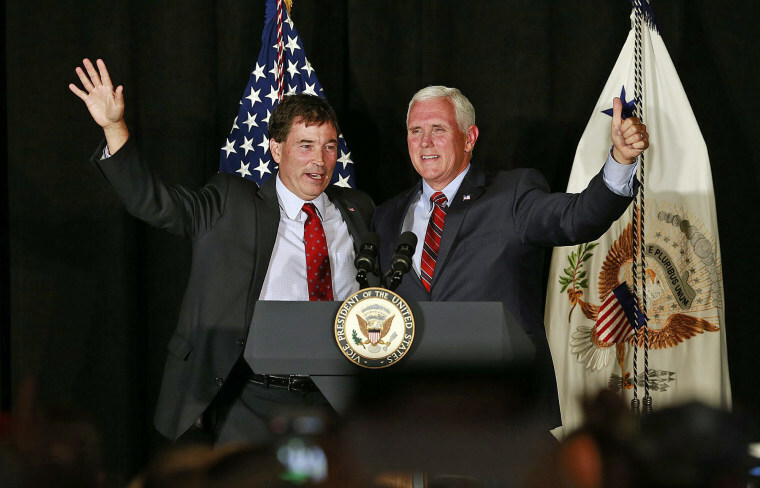 “President Trump has demonstrated that he's all-in for our GOP candidates this year, so he’s looking forward to showing his support for Troy Balderson,” said Michael Glassner, the chief operating officer for Trump’s presidential campaign. Trump held a similar rally for Saccone days before the Pennsylvania special election, but Lamb ended up winning anyway. Trump continued to consolidate his grip on the Republican base since then, with recent polls showing close to nine-out-of-10 Republicans approving of the president, so his support could go further this time. But Democrats say the White House intervention shows Republicans are nervous. "They are in the break glass, desperation mode by bringing in Trump and Pence within a week and putting up 5,000 points on the air," said Isaac Baker, a Democratic strategist working with the O'Connor campaign, referring to a measure of TV advertising. And John Russell, an activist who lost the Democratic primary to O'Connor, said Trump's visit will also fire up Democrats by serving as "a reminder of how bad he is." Vice President Mike Pence traveled to the district last Monday, telling supporters, "Ohio has a chance here to make a difference in the life of the nation." Balderson, who came under pressure from a conservative challenger in the primary, touted his “conservative grit" and used a TV ad to vow that he will "build Trump’s wall and defend Christian values.” Later, he called himself a "Trump guy." But the district has been a stronghold of Ohio Gov. John Kasich, a term-limited moderate who has become one of Trump's most vocal critics in the GOP. Kasich initially declined to endorse Balderson, suggesting in an interview with the Guardian that he wanted to see the GOP congressional candidate show more "independence" from Trump. O’Connor tried to take advantage of that, with a strategy to pick off Kasich voters and a TV ad featuring a Kasich supporter who said she now plans to vote for the Democrat. Democrats have also attacked Balderson's ties to another Ohio Republican, Rep. Jim Jordan, who has been accused of turning a blind eye to sexual abuse while serving as a wrestling coach at Ohio State University. Kasich eventually came around, however, after Balderson expressed some disagreements with the president’s policies on trade and other issues. “Troy Balderson has my vote, he should have your vote, too,” the governor said in a commercial he cut for the Congressional Leadership Fund, a GOP super PAC. O’Connor, meanwhile, has had his own stumbles in trying to separate himself from Pelosi, who is unpopular in the district and featured in GOP attack ads. Like Lamb and a growing number of other Democratic candidates, O’Connor said he will not vote for Pelosi to be his party's next leader. But when MSNBC host Chris Matthews pressed him in an interview on the subject, O’Connor eventually said he would vote for Pelosi if she were the only option available to give Democrats the House Speakership. Republicans pounced, with a CLF ad accusing him of “lying” about his plans to oppose Pelosi. O’Connor responded by calling the attacks misleading, while sticking with his call for “new leadership" as the closing message of his campaign’s latest commercial. The special election was triggered when former GOP Rep. Pat Tiberi retired to take a job leading the Ohio Business Roundtable, expressing frustration with the political environment. Balderson and O'Connor emerged from crowded primaries.